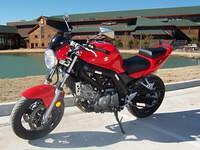 I bought a 2006 Suzuki SV650 today. It’s been 18 years since I’ve driven a bike from the dealer. It was as much fun today as it was when I was 14 with a brand new shiny ‘88 Yamaha TW200 dirtbike.The foot pegs are higher and farther back than any other bike I’ve driven before. I know it’s not much at all compared to a full blown sport bike but I’m a bit rusty. There’s still wet spots and sand everywhere after all the ice last week. The clutch starts engaging as soon as I released a little bit and the power came on smooth. I started feeling comfortable quickly. 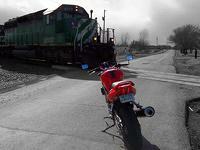 The banker and I talked quite a bit about motorcycles since he rode bikes too. I had tried to get Ducati Multistrada and had made a few trips to talk to him and actually made my bids from my laptop in his office. He asked me to bring the bike by sometime so he could see it. It was a few minutes till 5:00 so I brought it over. We talked for 20 minutes while Ellen went down the street to pickup Gabriel from preschool. Ellen pulled up next to me and rolled Gabriel’s window down. He was grinning from ear to ear. We went to Rib Crib to eat and then I went for a ride. It cruised along nicely around 5000rpm or so and picked up a little vibration around 5500rpm. A twist of the throttle and the vibration goes away and the motor comes to life. 8500rpm and it’s music but I’m already passing the posted speed and have to let off. I decided it was time to head over to the expressway to open it up a bit. We roll up to 70mph quite easily and I take the next exit off. I went home to meet a co-worker that was giving us his son’s old bed for Gabriel. After Gabriel went to bed, I decided to go out again while the weather was still cooperating (they are talking snow tomorrow). I head south toward some curves a couple miles from the house. Then head on down county line road and follow it around to south of Coweta. I had some gloves and a turtleneck on this time and it wasn’t too bad (mid-40’s when I started). I get into the hills with the creek bottoms and it’s freezing in the valleys. It’s the burning cold going down and actually feels warm coming up the hills. I head through town and north on the highway. That wind is finally starting to get to me on the open highway at 55-60mph.